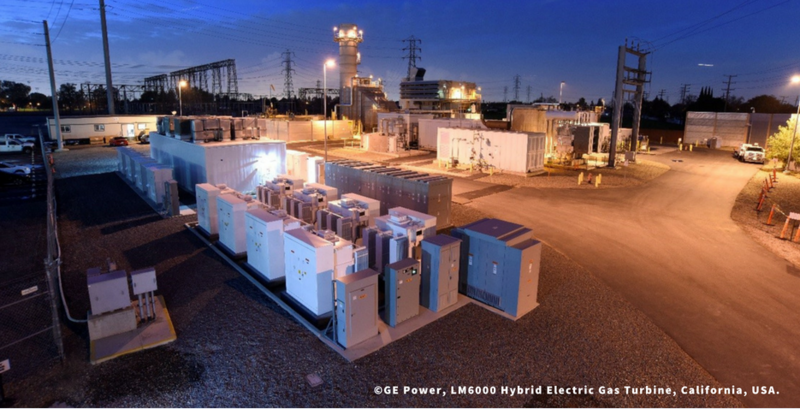 The LM6000 Hybrid Electric Gas Turbine integrates a 10 MW/ 4.3 MWh energy storage battery system and a ground-breaking control system capable of providing quick start and fast ramping to balance variable energy supply. Variable energy supply happens when renewable production falls following weather conditions or the time of the day. The system provides enough time coverage to allow the gas turbine to start and reach its designated power output. It does not need to burn fuel and consume water in stand-by mode, reducing greenhouse gas emissions and pollution by 60 percent and water consumption by approximately 45 percent. In 2017, the Hybrid EGT received Edison Electric Institute and ESNA innovation awards. The LM6000 Hybrid Electric Gas Turbine is located in US but has similar use-cases in Europe in optimising the operational profile and the related emissions of fossil fired power plants. Frequency regulation and primary control reserve are already services marketed in Europe and could benefit from the presented hybrid approach.